Lion International Club member Shirley showing Lion Sofia and members of the Roodepoort Host Lions Club how to make a Snuggler. Picture: Lions Club International District 410B. 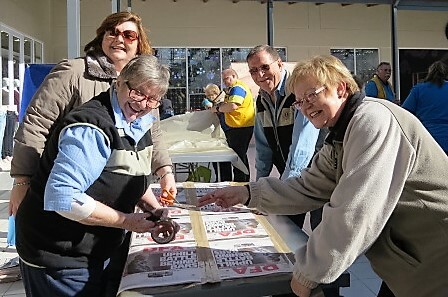 The Lions Club International are putting their green fingers forward, as they serve community members in need with sleeping bags they make from plastic sheeting, newspapers and tape. Newspapers, plastic sheeting and tape may seem like unlikely materials to make sleeping bags, but for many homeless people, the combination makes for a warmer night on the streets. 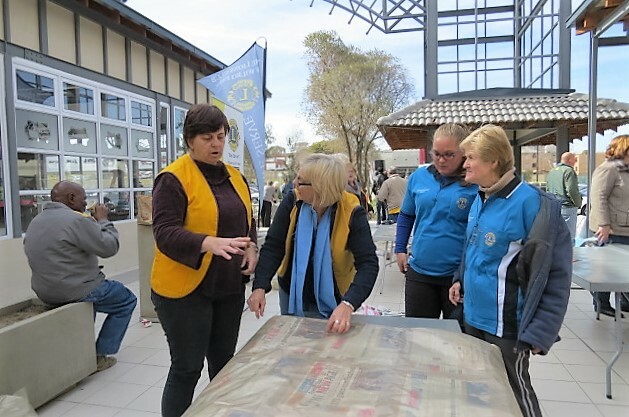 The Lions Clubs International – in the district that covers Gauteng, Mpumalanga, North West, Limpopo and Swaziland – tapped into a green solution to help keep homeless people warm in a project named the Lions’ Snuggler Sleeping Bags. The clubs’ members put their creative ingenuity to work to create the ‘Snugglers’ – as the clubs nickname them – by taping piles of folded newspapers to plastic sheeting and sliding them into plastic bags to make sleeping bags. 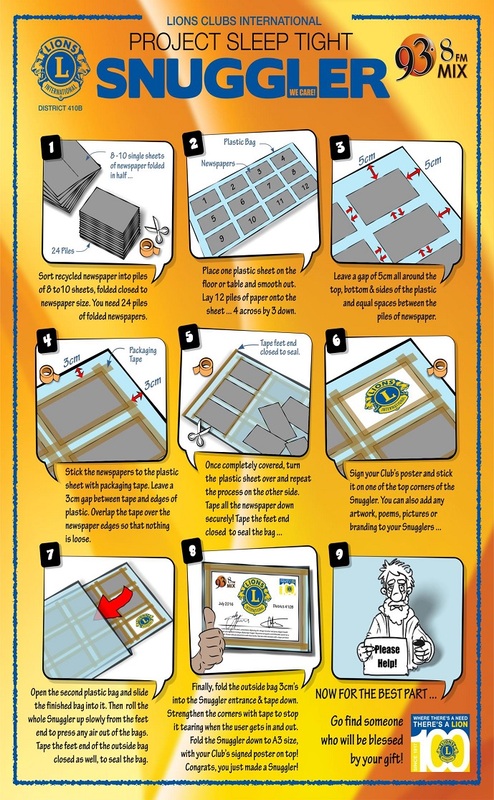 The Lions Clubs International how-to guide on making the Snugglers. Picture: Supplied. It seems the idea for the sleeping bags was initially designed by Jo Maxwell, who, according to the Design Indaba website, is a Cape Town resident who prototyped sleeping bags in 2005 using recycled, heavy-duty plastic bags and 10 layers of newspaper. 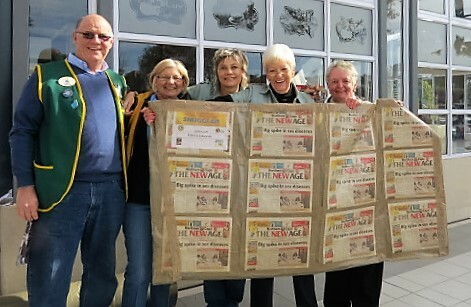 Lions Clubs International public relations officer for the district Sandy van Heerden said the Snugglers were distributed to those in need in a number of ways, as some Lions Clubs International members took to the streets on cold nights to hand out the blankets to homeless people who were sleeping on pavements and in doorways. “Other sleeping bags were delivered to shelters to hand out once they were full for the night so as not to leave anyone out on the streets with no protection against the cold and dampness,” explained Van Heerden. Van Heerden further explained the sleeping bags were not meant to be a permanent solution but would be a temporary measure to keep those in need warm. The Edenvale Lions Club is one of the Lions Clubs International that participated in the project, and treasurer Evelyn Herzfeld also described how grateful everyone had been at receiving the Snugglers. She said only one woman had refused one, saying that she would not use a sleeping bag, as it would be difficult for her to climb out of it and run away in the threat of danger. She said she knew newspapers to be traditionally warm and believed the Snugglers were warm, as well as portable, as they could be folded easily. She further explained the project satisfied many aspects of Lions Clubs International, such as caring for the homeless, avoiding wastage, serving the community and recycling. Lions Clubs International have offered people the opportunity to give back to their communities since 1917, in the mission, ‘We Serve’. Van Heerden seconded that the environmentally-friendly aspect of the sleeping bags was a drawcard, as the environment was an important portfolio. “Lions collected and recycled all the newspapers, and some of the rolls of plastic used were manufactured from recycled plastic,” said Van Heerden. She said the cost of making each Snuggler was about R40, but said the clubs were assisted by donations of newspapers, tape and plastic from members of the public and companies. Some members of the public even signed short messages of hope for the recipients of the sleeping bags. Both Van Heerden and Herzfeld gave thanks to the communities and companies that lent a hand in donating the materials used to make the sleeping bags. When the project was launched at an initial Snuggler-making event held at the Midrand China Mall on July 2, where 12 clubs participated in making 200 sleeping bags, the target was to make and distribute 500 ‘Snugglers’ for the month of July, but as the word spread, more Lions Clubs throughout the district, organisations, corporates, scout groups and schools lent their hands to the cause. 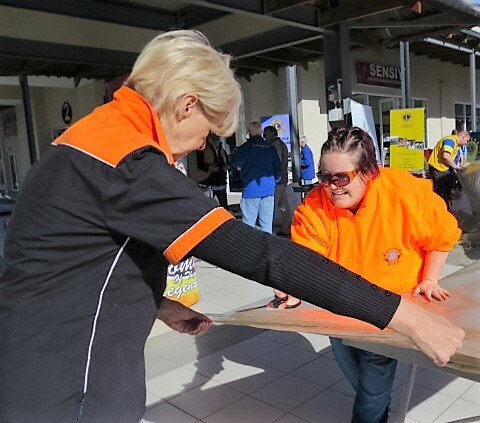 “There are Lions Clubs throughout the country participating,” said Van Heerden. The Cape Town and Groote Schuur Lions Clubs, as well as the Eden Lions Club of George had been involved in making the ‘Snugglers’ previously. The project is still continuing, with the next Snuggler-making event due to be held on the first weekend of October. Lions Moira Theron, Meredith Wilther-Sturges, Pierre Theron and Jacqui Hocking put their creative fingers forward in making a Snuggler. Picture: Lions Club International District 410B. District Governor Bernd Gerhard pictured in 2016 with a proud Lions’ team hold up their completed Snuggler. Picture: Lions Club International District 410B.